GOES-16 1-min imagery captured some incredible views of severe storm over the northern High Plains on 6/28/2018, including a large tornado producing storm in southeast Montana crossing into northwest South Dakota (Figure 1). A nearly stationary storm in North Dakota produced severe hail and heavy rainfall, prompting a Flash Flood Warning. Apparent are persistent overshooting tops and above anvil cirrus plumes, indicating strong and long-lived updrafts (Figure 2). 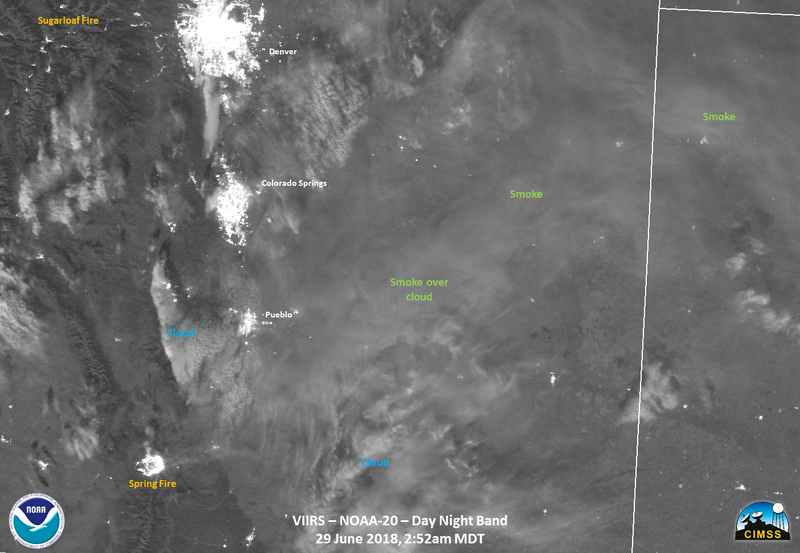 The Spring fire developed in northern Costilla County in south-central Colorado during the late afternoon of 6/27/2018. The fire quickly grew to over 1,000 acres by evening. GOES-16 captured the initial development of the wildfire hot spot (Figure 1) and associated smoke plume (Figure 2). By the afternoon of the 28th, the fire had grown to over 4,000 acres with no containment, and destroyed an estimated 30 structures. Given the dry and breezy conditions, NWS Pueblo had issued a Red Flag Warning for much of the region. Although the lower levels were very dry, moisture aloft led to the development of clouds in the area, and pyrocumulus at times over the fire. GOES-16 1-min imagery was available over the region on the 28th, and visible imagery captured the convective bursts (Figure 3). The hot spot was also detected by the Suomi-NPP Day Night Band (Fig 5). By the evening of Friday the 29th, the fire had grown to nearly 34,000 acres. While cloud cover remained over the region, the hot spot was still apparent as it expanded. The hot spot remained apparent through the evening (Fig 6). The fire grew to over 41,000 acres on June 30th. GOES-16 3.9 um channel imagery indicated two distinct hot spot areas become obvious during the day (Fig 7). The fire remains 0% contained. The Satellite Training and Operations Resources (STOR) VLAB page has recently been developed to serve as a “one-stop shop” for satellite-related resources for NWS AWIPS users. With GOES-R and JPSS recently coming online, the need to organize such resources was identified, so the page was developed and initially populated by the NWS/STOR team and satellite training community. In the future, NWS SOO’s will likely also be able to submit content. The front page features recent and relevant news, a satellite training calendar, and a table of contents. The navigation bar and drop-down menus at the top of the VLAB can be used to access content from anywhere within the STOR. Examples of content include brief training material, relevant blog posts and sites, procedures, color tables, a forum for discussion, and more! Some of this material can be accessed directly from AWIPS/D2D via the AIR. Enjoy this incredible resource, and let us know if you have any suggestions! GOES-16 imagery in AWIPS-II transitioned to Fixed Grid today at 1527. See below for information and examples. The example below (Figure 1) over eastern Kansas uses 1-min VIS and IR imagery at 1526 UTC (old) and 1527 UTC (new fixed grid) to exemplify the transition. When using the CONUS projection in AWIPS, the pixels now appear diagonal (away from position of the satellite sub point) and larger (with distance away from satellite sub point). Considering the data are no longer smoothed across pixels, the imagery and features within (cu, anvil edges, overshooting tops) appear crisper. A longer 1-min animation centered over the time of transition (Figure 2).